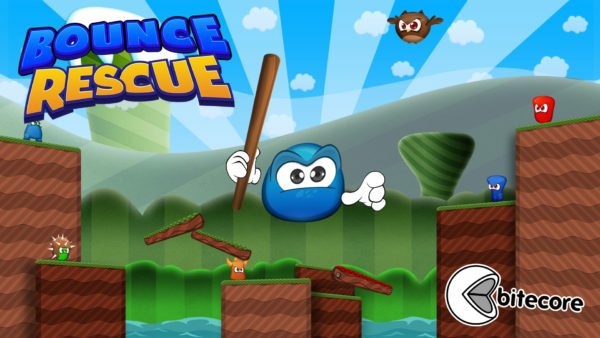 Bounce Rescue is a brand new game released on Steam that was made in GameMaker Studio. Great graphics, solid controls, engaging music and even multiplayer make this a shining example of the quality that can be made with GMS. I spoke to Bitecore Studios to get some developer insights and details on how they made such a great game that also has some amazing technical features including: Full Steam Integration with leaderboards, controller support, achievements and even Steam Cloud saves, fantastic controls, different game modes like Capture the Flag, Time Attack and even Death Match. A true labor of love that you can tell from just seeing it so take a quick couple of minutes to read on about Bitecore Studios and Bounce Rescue. Bitecore is an Independent Game Development Studio created by 3 guys: Antti, Kim, Ari; and is founded in Ylivieska, Finland. Between the 3 of them and GameMaker Studio they can cover almost every aspect of creating a game all in house which not only cuts down on costs but gives complete control over how the games will look and feel. The synergy between them really matches up well. Antti has dedicated everything to Bitecore Studios since 2015, making it his full time job and the results reflect that dedication. Bounce Rescue is a platformer which feels very much like Super Mario Brothers with better controls and unique graphics. The gameplay is very fluid and finding characters to rescue is rewarding, as is placing higher and higher on the leaderboards. Overworld maps are a very interesting way to move from level to level and really gives the player a grasp on how large the world is going to be. The sound effects and music are also very fitting and nothing seems off, timing is perfect. The multiplayer is also rewarding as the game modes are varied and maps are plentiful, perfect for some quick couch co-op battles. Here are some highlights from my discussion with Bitecore Studios; I wanted to get more technical in nature as I think the game speaks for itself from a gameplay perspective and readers on GameMakerBlog would be curious on the creation aspect. Bounce Rescue looks, plays and feels amazing and I can imagine that many hours went into making a game of this quality. 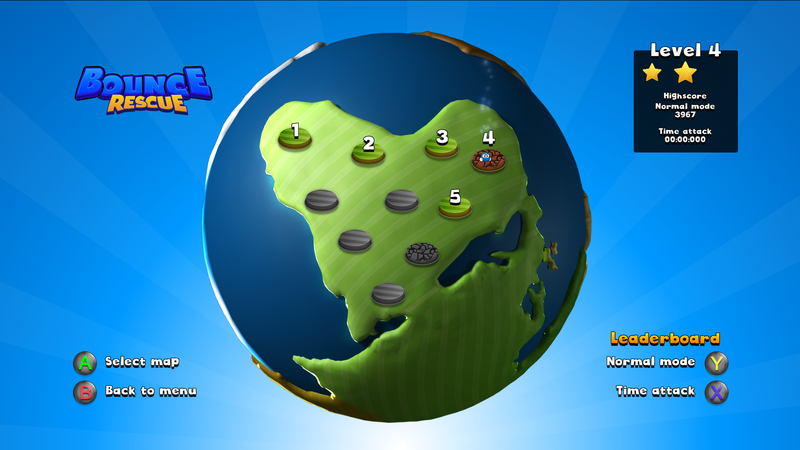 How long did it take to make Bounce Rescue? What version of Gamemaker Studio did you use? If you used GMS 1.X are you planning to upgrade to GMS 2? If you used GMS 2, how did you like it? That is great to hear, I suspect we can expect a new game using GM 2.0 on the horizon then. There is excellent full gamepad support, did you code that yourself or use a marketplace asset? It really works flawlessly and I was very impressed using my xbox pc controller. The graphics look amazing, the animations are clean, crisp and look perfect for the characters, enemies, traps, really everything goes together very well. Did you create everything in-house or seek outside help? I actually have the same comment and question about the music, which fits the game perfectly. In-house or Outsourced? For the multiplayer splitscreen, did you guys use cameras/views? Did you run into any problems when you first tried creating it? What were the biggest challenges you faced during development? Let’s talk about Steam integration, Bounce Rescue has everything from: Achievements, Leaderboards, Stats and even Cloud Saves. How tough was it to add all this using GameMaker Studio? Last question, Did you guys code everything in-house or were there any frameworks you guys ended up using? Well it definitely shows, Bounce Rescue is very unique and really shows what talented creators can make using GameMaker Studio. Excellent job guys.